This is the sixth in a series about how nine clients or friends successfully transitioned or transformed their careers after age 50. This month I will describe how one client made the transformation to new work that was a major departure from his previous work and industry. The graphic above shows the degree of difficulty and the economic considerations when seeking a major work shift. 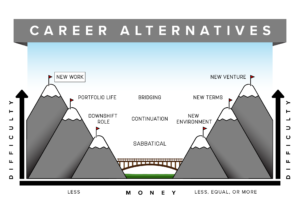 This career alternative involves a change in the nature of your work, uses different skills and expertise, and often involves a change in industry as well. Tim began his career as an accountant, and spent 19 years in various financial roles, eight as a CFO. He has a total of forty years experience in manufacturing. For 24 years he was either CEO or COO at one of two companies. He is a strong believer in servant leadership and building a culture of accountability. Tim has a Midwest upbringing, is family oriented, and genuinely cares about the people with whom he works. The previous business Tim was involved with (for 28 years) changed hands five times during his tenure as CEO. He survived the changes, but the final sale involved an international business group headquartered in Chile. They eventually decided to move the top role to South America. At the time, Tim was thinking he was ready for a new experience, and in many ways, he felt that it was time to move on. Despite that, he says he would not have chosen to exit. He was 52 years old at the time he left the company. While in transition, one of the options that greatly interested Tim, was to work with others to create a version of a private equity firm to acquire compatible companies which could be held or sold over time. I saw Tim light up when he shared this idea, and it came up many times in the months we worked together. Tim had completed one significant acquisition in his career so he knew he had the skills to do this work. He enjoyed the experience, and it was very successful. The biggest problem with Tim’s private equity dream was financial risk. He did not want to endanger his family’s financial wellbeing. He needed to discover a different version of his dream, and that is exactly what happened. With the help of a network connection, Tim landed in a small privately held business with a strong and stable ownership. The company had a real desire to grow, with a strong leaning towards acquiring other existing good businesses. Tim started as CFO, with no real plan as to what would happen from there. He was unsure of his ability to reinvent himself, having been in the same business and industry for so many years. Tim successfully transitioned from a company in the steel industry to one in the printing space. He was also shifting from a $100M mining equipment business with a $2B parent to a similar sized entity in a different industry, minus the resources of a large parent company. Tim had done only one acquisition in his entire career, but his new job from the start was acquisition oriented. His company has accomplished sixteen acquisitions since Tim started eleven years ago. His business has flourished and is now the 23rd largest print company in North America. Growth has been well over 500% since Tim started. The owners are values based with a a priority of creating an excellent business and developing people. The company works to be nicely profitable yet keenly aware that it also needs to be a good corporate citizen, and takes good care of its people. Tim is the only non-family officer. Tim was allowed the opportunity to create the vision of the business and execute the strategy that led to tremendous growth in a relatively short time. As he reflects on his experience these past eleven years he says, “The scenario has played out similarly to what my vision was in transition, without the financial risk. The plan worked! In addition to running the day to day affairs of the business, creating an industry leader has been both challenging and immensely rewarding. The process of assessing, acquiring and then managing and growing these companies has been a tremendous personal growth and learning experience that totally exceeds my expectations. As you might guess, I am a huge fan of Tim and what he has accomplished in the past eleven years. I meet with him several times each year both because Tim has become a good friend, and his career transformation and business success inspires and enables me to pass on the hope that comes from his story. One thing that is unique and inspiring is that Tim’s company is not in the business of growing a company over five to seven years and then selling it. Rather, it buys and builds its acquired companies, holding on for the long term. Tim’s example not only deviates from the usual private equity timelines, but his story also goes against another trend. You may have heard that most senior executive jobs last an average of only three years. Tim will soon be starting year twelve in a job he began at age 52. 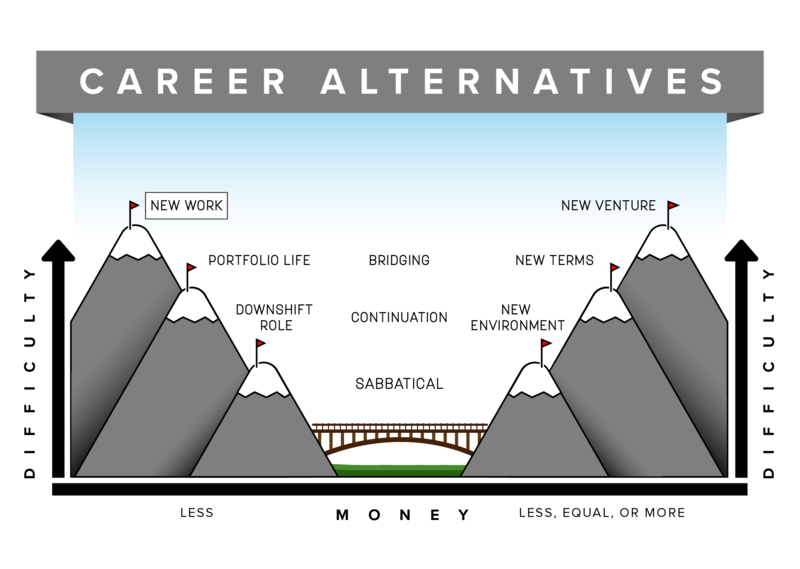 Here’s to career longevity, and finding a new and better path. And here’s to buying and building companies, and building new careers with staying power after age 50!